Written by Janet Choi on July 9, 2015 . Segmentation is the not-so-secret key to email marketing success, because it’s all about preaching to your choir. Segmentation is when you group people based on certain shared characteristics in order to customize your message to strike a chord. It’s a way to personalize your communication that’s still scalable. Using segmentation to communicate with instead of communicate at your audience simply works to improve metrics across the board. Your opens, clicks, and conversions go up while unsubscribe and spam rates go down. Because you’re sending better targeted emails, you also end up sending less email. That means happier subscribers, better deliverability, and increased revenue. Basic biographical and demographic details include location, age, gender, job title or role, industry, education or income level, marital status, and language. While some tools can automatically track certain details like location, this type of data usually relies on people to proactively providing it at some point. Again, collecting this data requires a combination of automatic tracking (of details like user behavior, preferred device, or referral source), self-segmentation by people providing details (like topic preferences), and analysis (creating and understanding personas). 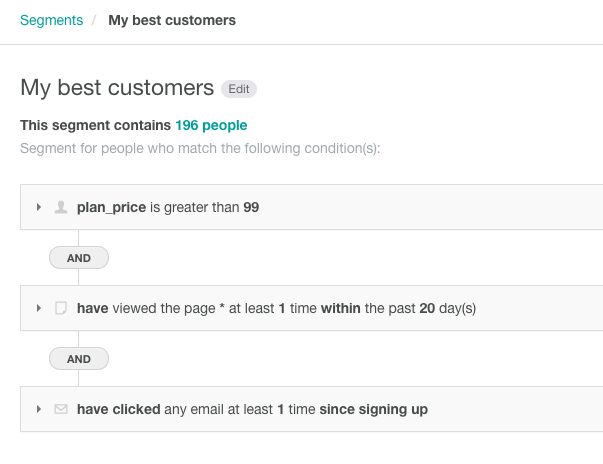 Grouping people based on your funnel and their customer lifecycle stage is one of the most effective ways to segment. A person’s level of interaction with your business directly affects the relevance of your message. If you’re a segmentation newbie, Diana Smith’s 3-step framework of “discover, engage, and convert” is a great place to begin thinking about funnel stages. You’d want to segment newer users, for example, to teach them about how to get started with a key feature. You can also dig deeper and segment based on the pirate metrics funnel, mapping segments to stages of acquisition, activation, retention, referral, and revenue. The approximate way to segment people based on lifecycle stage is to base groupings on sign-up or account creation date — and that’s the idea behind many automated drip campaigns. Even more effective, though, is to go beyond time elapsed since signup by incorporating behavioral data. Your message is the most relevant when it responds directly to individual activity. Real-time behavioral data provides for the most effective segmentation. Today’s segmentation is a far cry from static lists that require constant updating, syncing, and spreadsheets. Real-time, fluid groupings ensure your messages accurately flow along with your users’ experience, and your recipients are always up to date. Well-known examples of behavioral data-driven segmentation come from the e-commerce world, with segments based on purchase history and events like abandoned shopping carts. But there are many different types of behavioral data, based on everything from pageviews, events and app actions, and email activity. Here’s one example of a segment we use at Customer.io to trigger a behavioral email campaign to new users. It’s composed of anyone who hasn’t yet integrated with our app — a key activation task. Using this segment ensures we’re only reaching out to people who haven’t completed the integration yet. Or think about overarching segments that combine subgroups. Here’s how we currently segment our “best customers”: Now, without further ado, here’s a list of 33 ideas to get your segmentation started! Have any creative segmentation suggestions? Share with us in the comments!